Firemen who gave their lives in the Coventry Blitz. Dedicated to the memory of Coventry firemen. Located in St. Mary's Guildhall, Coventry there is a plaque dedicated to the firemen who gave their lives during the Coventry Blitz. 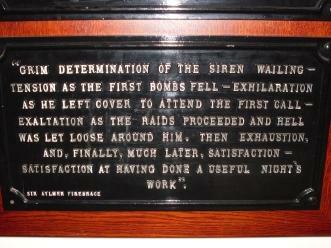 "Grim determination of the siren wailing - tension as the first bombs fell - exhilaration as he left cover to attend the first call - exaltation as the raids proceeded and hell was let loose around him. Then exhaustion, and, finally, much later, satisfaction - satisfaction at having done a useful night's work. Note - four slight discrepancies in spelling of names between the memorial and records on my site have been noted and checked against official records. In all cases my records were found to be accurate. Plesae note, you can click on many of the names listed here in order to read further details about them. Traumatised by his experiences both as a gunner in the First World War and twenty years later as an Air Raid Warden in 1940 s Woolwich, Reg Burt finds it impossible to talk to his grandson, Tom about his early life. However, following a visit to a local fair Reg decides to write a journal for his grandson about what he did during the war detailing his experiences in graphic detail. Following Reg s death, Tom s parents give him the journal allowing him at last through his beloved grandfather s words and sketches to learn about his life and the grandmother he never knew.